An established Educator from Poundmaker Cree Nation, Dion maintains the family reputation of perpetuating language, beliefs, values and practices through his work in the education sector, and at cultural events as a master of ceremonies, storyteller and Knowledge Keeper. 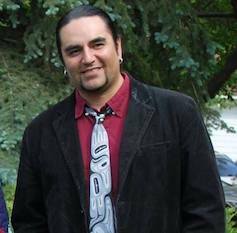 He is a professional teacher since 2004, Dion has worked both on-Nation, for Catholic and public-school divisions in Alberta and Saskatchewan and for Mount Royal University in Calgary teaching Science, History, Language Arts and Indigenous Studies, as well as a guest lecturer for the Indian Teacher Education Program at the University of Saskatchewan. He now serves as Cultural Coordinator under Student & Learning Services at the Saskatchewan Indian Institute of Technology, providing cultural and linguistic programming, curriculum development/enhancement, as well as coordinating Elder & Ceremonial support. Dion is honoured to present on occasion as a member of the Speakers Bureau of the Office of the Treaty Commissioner.